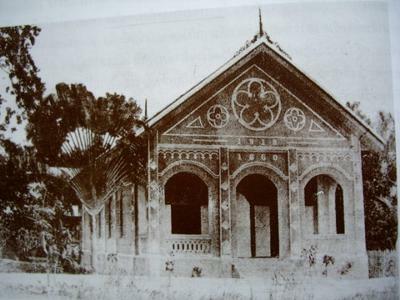 The First Presbyterian Church in Samray, Bangkok was built in 1860 and rebuilt in 1910. But the design of the church has remained unchanged, an excellent example of preservation. Little wonder the church was honoured with the architectural preservation award by the Siam Architecture Association in 2004. 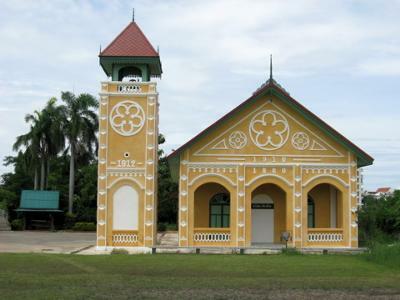 In 2005, the church was one of Thailand’s entries for the UNESCO Cultural Heritage Conservation Award. Here are some photos of the First Presbyterian Church through the years. Photo 1 – This was taken after the rebuilt in 1910 but before the belfry was added in 1912. 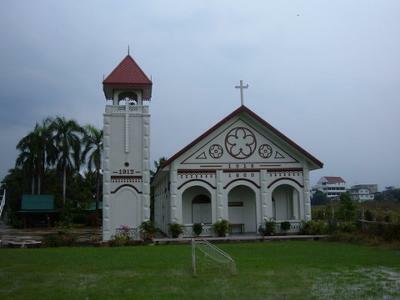 Photo 2 – In this photo, the belfry was added. 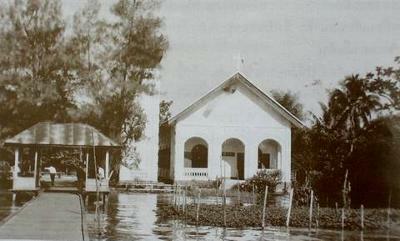 Notice how close the river is to the church. Sometime between 1967 – 1981, the area in front of the church was dammed, the water drained off, earth and sand were dumped to fill up the area. Photo 3 – This was taken on my first visit to the church in 2005. Notice the field in front of the church. This used to be part of the river. Photo 4 – Photo taken in 2008. The church was originally white, now it’s yellow. The design hasn’t changed. Since October 2010, the First Presbyterian Church has been going through a major renovation which is still in progress. I won’t spoil the surprise which is in store over the renovation of the church. You’ll get to read about it and see the photos when the work is completed. Except for Photo 3 which was taken by me, the others are with the courtesy of Ahn Sittiyot from the First Presbyterian Church. My thanks to her for her invaluable contributions.